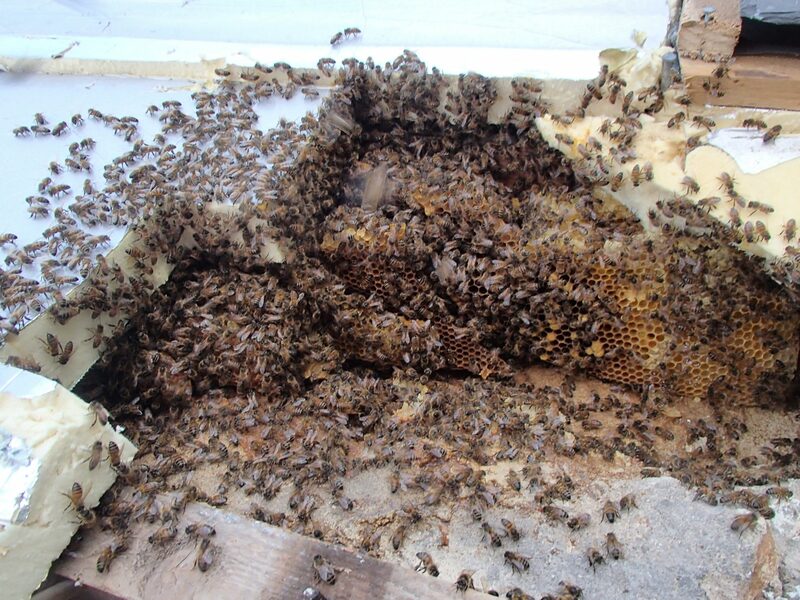 We specialise in live honey bee removal from places beekeepers and ordinary pest controllers can’t, we will also collect local honey bee swarms for businesses that require properly insured professionals on site. We have extended our service to cover the whole of England and Wales and any where else so long as all expenses are covered. These days we do most of our assessments without the need for a survey. Sometimes its beneficial and if we are travelling past somewhere and its convenient to all we may stop to do a quick survey. However the majority of honey bee removal work that we carry out is from chimneys, having done as many as we have, we know what to expect as a rule. As a result we know what questions we need to ask you, which combined with sufficient photos can provide us enough information to give you a good idea of how much its likely to cost. Unfortunately removing honey bees is not a cheap exercise but the cost of an expensive survey can go a long-way towards the cost of the job. 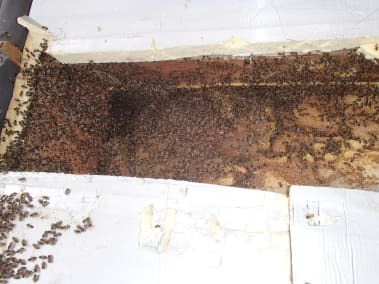 If its felt that a site visit is really needed for some reason; possibly because the bees are in an awkward spot and its difficult to assess the best method to get to them to remove them. Then this is a great time to confirm that it is honey bees that have colonised the property if that has not already been confirmed. 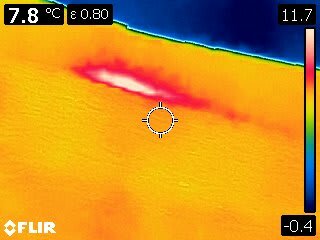 We will probably use our thermal imaging camera to establish the exact location and extent of the honey bee colony which then allows us to discuss with you the various options available for the removal of the honey bees outlining all the advantages and disadvantages of each method. We discuss the levels of proofing needed to prevent recolonisation of the area, what is required in the way of bee removal and cleanup, the possible use of insecticide after a cutout and the proofing required to prevent access by any robbing honey bees from other colonies. 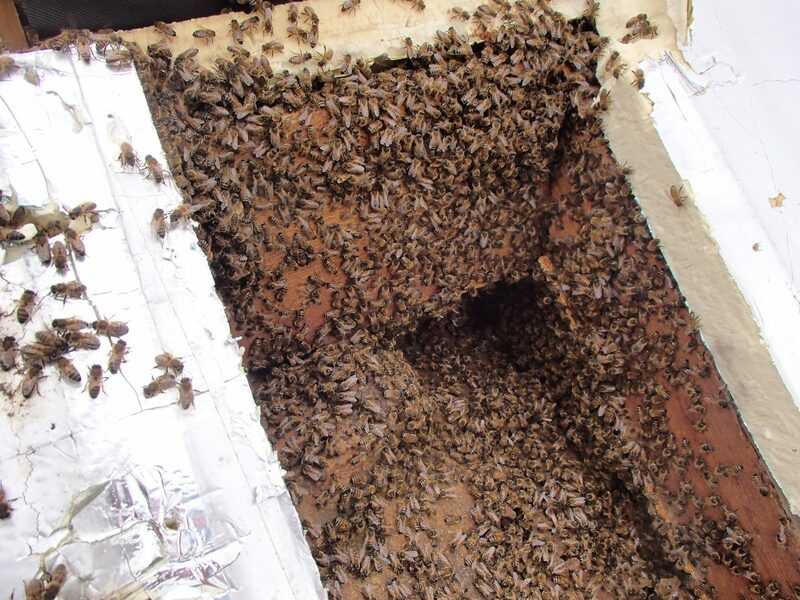 We use a variety of methods to remove honey bees from wall cavities, chimneys, flat roofs, soffits, gables, behind wall tiles, beneath roof tiles and from anywhere else you might find them. Every honey bee removal job is different but at the same time the same basic principles are used. There are two main options for the removal of honey bees that have colonised a wall cavity. 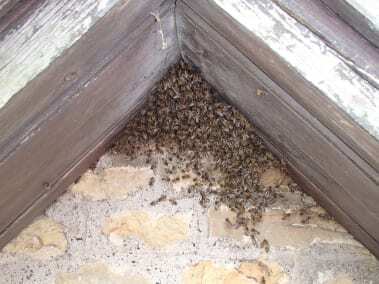 The least intrusive is referred to as a trapout, the result of which is the removal of the bees and the honey, main disadvantage of using this method is that it takes 6 weeks or more and generally needs to be carried out during the late spring and summer months although there are various options on how this is done dependent upon the circumstances and the desired outcome. 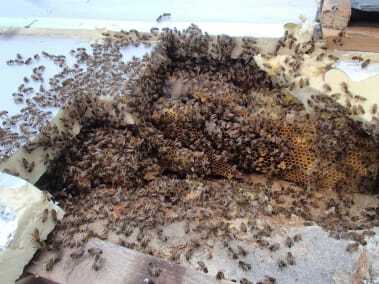 The second method involves the removal of sufficient bricks, boarding or plasterboard to access the colony to enable the complete removal of the comb, the honey and the bees. This maybe carried out from within the property or from the outside of the property dependent upon circumstances and accessibility. This method offers a fairly immediate solution for the removal of the bees. When honey bees occupy a chimney space it is usually one of two scenarios or on occasion a combination of the two. 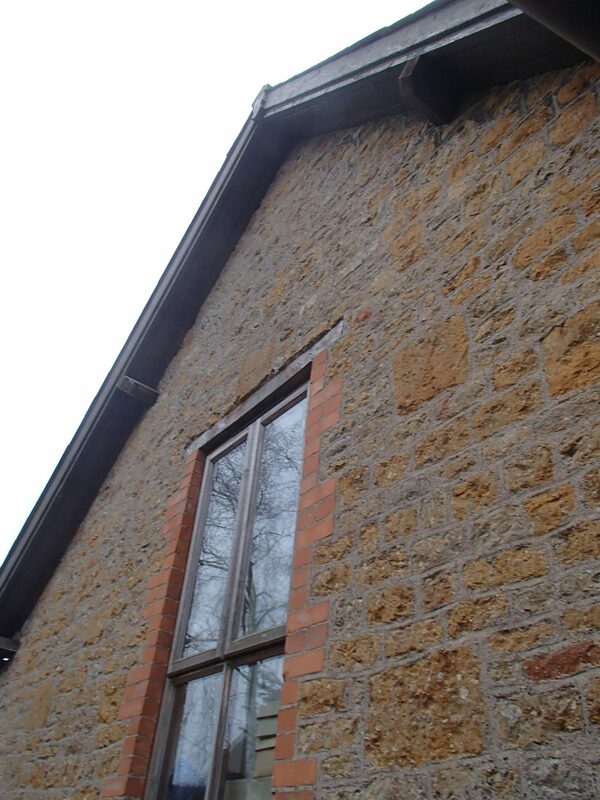 Often bees will find there way between a gas flue or solid fuel burner flue and the original chimney, more often than not it’s the space between a gas flue and the original chimney. In situations such as this we need to utilise a gas engineer to decommission and remove the gas fire so that we may then carry out our work and for the fire to then be recommissioned. 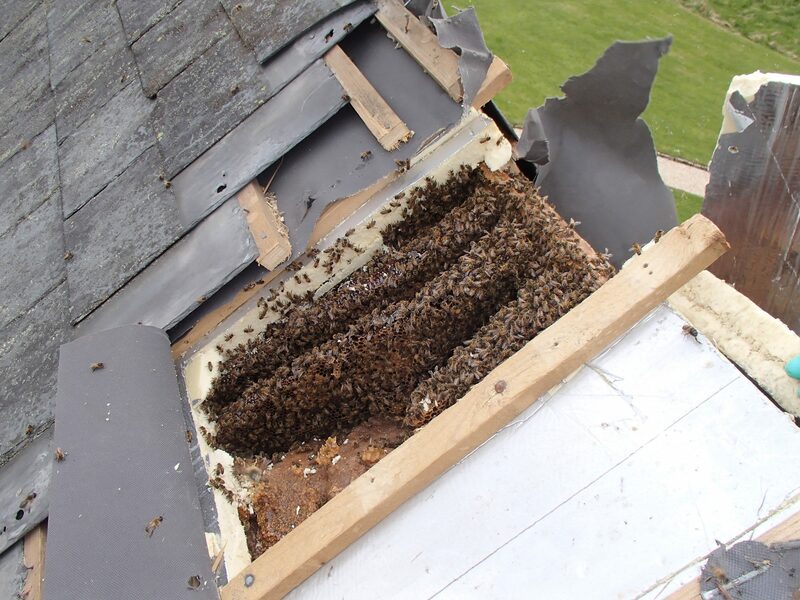 The second scenario is where honey bees have colonised a chimney space that has been capped, be it with a chimney cap (that are rarely designed to keep wasps and bees from setting up home) or as a stone or concrete slab over the chimney as part of the flaunching. In these circumstances we are able to remove the comb, honey and wax. We have not yet needed to dismantle a chimney to do this (not saying we haven’t felt like using a stick of dynamite on the odd occasion). 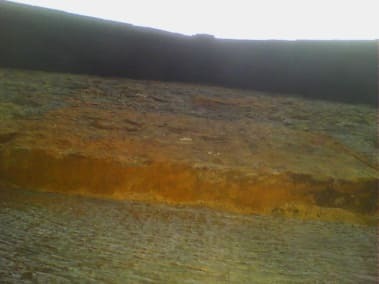 The most common reason for honey bees being able to access these locations is due to the poor condition of the flaunching as a result of the weathering over the years. 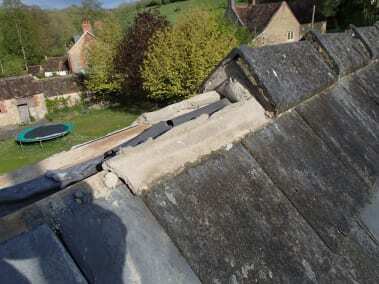 Where we need to remove this to allow access we reinstate at the end of the job. 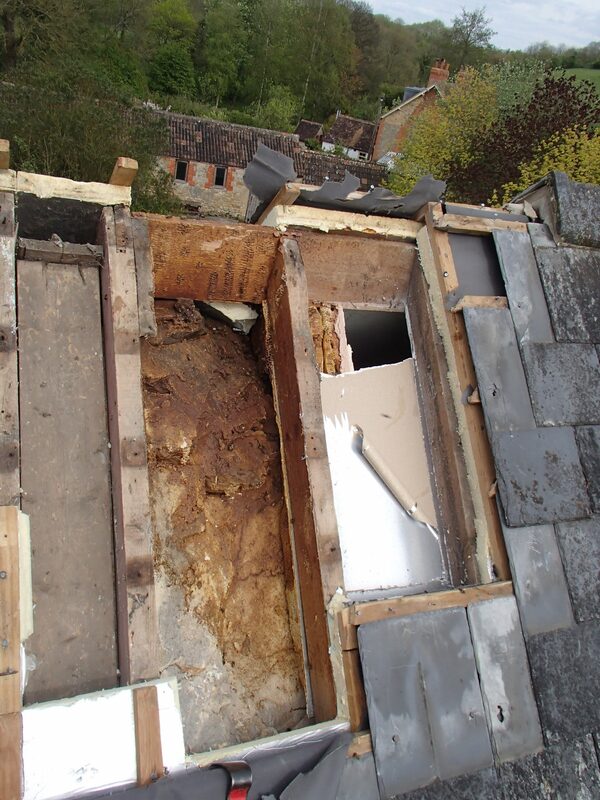 NB We have not found it necessary to dismantle a chimney stack to remove and relocate honeybees. In fact we have only once had a go at stripping down a chimney stack and that was because the stack was going to be removed anyway. This can be carried out in one of two ways dependent upon the circumstances. 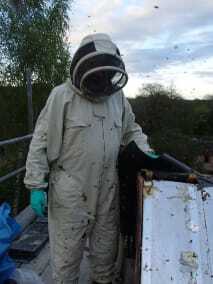 Often we are able to carry out a trapout which removes the honey bees and the honey but not the wax comb. Alternatively we can carry out what is generally described as a a cutout, from either within the property or from the outside of the property. Dependent upon the size and type of roof this can sometimes be done without having to damage either the ceiling or the roof. 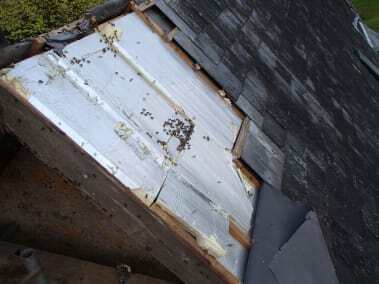 But generally one or the other needs to be damaged to allow access to the honey bee colony. 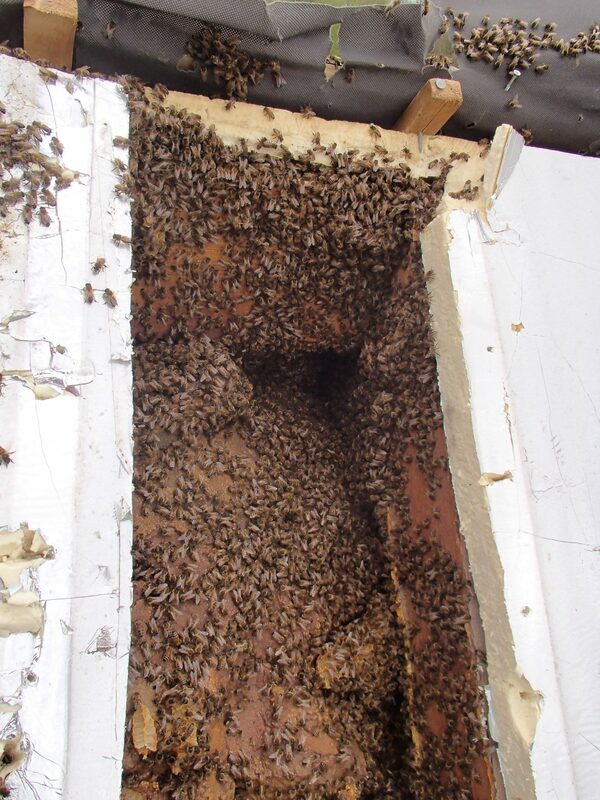 Removal of honey bees from soffits is generally carried out by removing the soffit to allow full access to the bees and the colony. 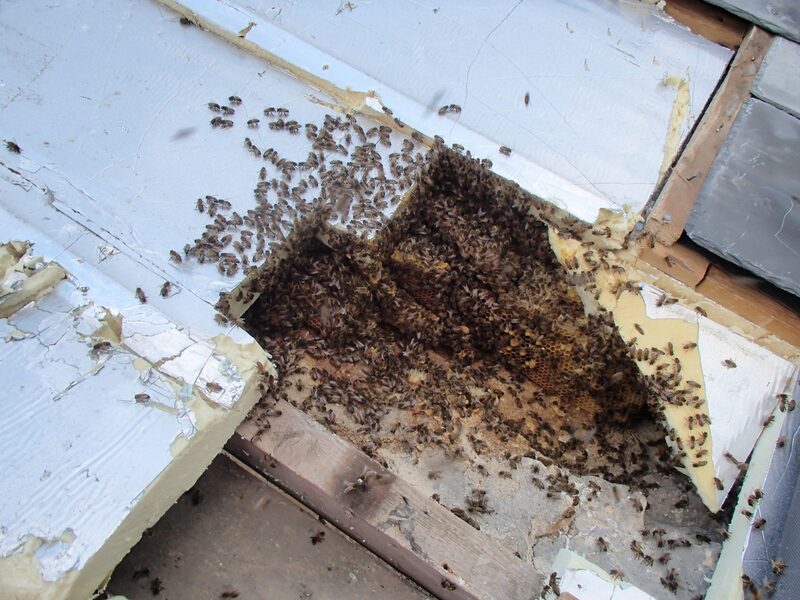 It’s usually a fairly straightforward task to reinstate the soffit after the removal of the bees. 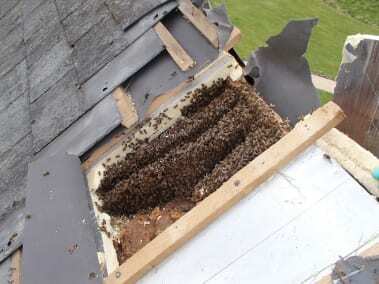 Generally speaking honey bees don’t colonise roof spaces, where they are flying in beneath tiles they more often than not are colonising a cavity wall or an old dismantled chimney stack that is hidden beneath the tiles. The easiest way to access these bee colonies is to remove the roof slates or tiles to enable the removal of the colony, the wax and the honey, before reinstating the slates or tiles. We are unable to offer a guarantee that additional swarms in the future won’t recolonise these areas because the scent that emanates from the comb and propolis lasts for years and is highly attractive to bees. The only way one could guarantee that the area would not be recolonised in these circumstances would be for the removal of the roof and the installation of insect mesh before reinstatement of the roof. We are well experienced in removing honey bee colonies from various and difficult locations, even a straightforward removal can be too much for most insured pest controllers and for uninsured experienced beekeepers. By using Swarmcatcher.co.uk you are benefiting from the fact that we are both professional pest controllers and beekeepers. 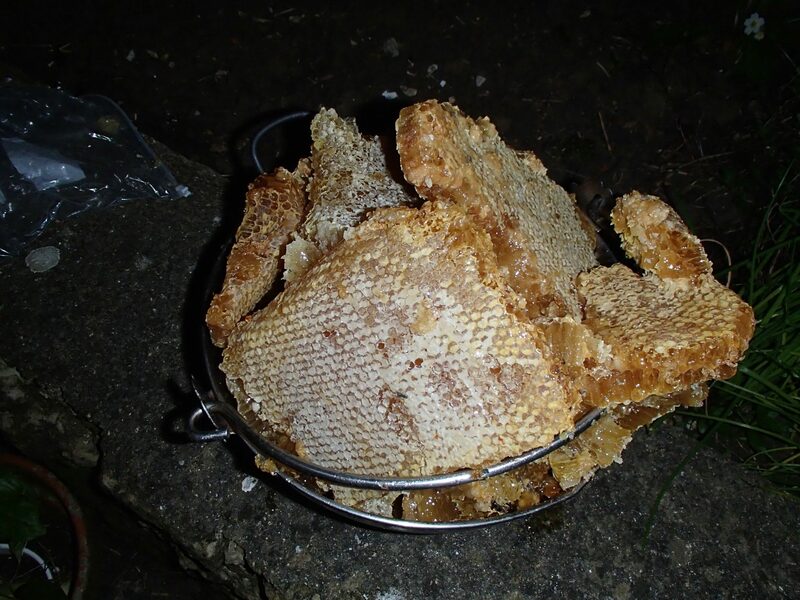 Each and every honey bee removal job is different from any other. When assessing a job we need to look at access, how easily and safely the area to be worked on can be got to. If accessing a colony from outside we need to look at ground conditions, whether safe access is available whether ladders, mobile scaffolding, scaffolding or some form of mobile elevated working platform (cherry picker) should be used. If accessing from within a structure we need to know that we can confine the bees to the area we are working in, protect the area as best as possible from any damage. Luckily honey cleans up easily using cold water, unfortunately wax doesn’t, furthermore you would be amazed at how difficult it is to remove bee excrement. Weather conditions are important, working at height with some nasty bees is not something to be done in wet or windy conditions. Nor should bees be worked on in thundery clammy conditions unless they are located at a great distance (several 100 metres) from areas accessible by people. Each colony reacts in a different way, some are calm and unperturbed by our interference, others can be very aggressive and nasty, this is all down to the queen, when rehoming these colonies we will look to change the queen to calm the nature of the hive. It is very difficult to assess the amount of time required to carry out the live removal of a honey bee colony, often a queen will find the most inaccessible location to hide in, and if we don’t get the queen then we will be coming back a second time. call 02922 401649 to speak to someone local who knows all about it. If you are looking for more info on removing bees from a chimney check out our article Removing bees in a chimney, for information on bee removal and relocation from roofs you may want to look at our page Honey bees in roof, or if you have bees in a wall our page Honey bees in wall maybe of use, For additional examples on removals of honey bees from other more unusual places check thru our blog page Honey Bee Removal EXPERTS and search for “unusual bee removals”. Thankyou for this article which made for such useful reading. 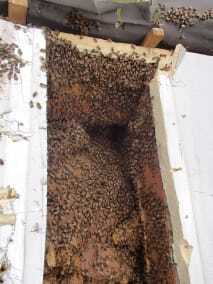 We have had a swarm happily nested in our chimney for at least 3 years. It’s an unused chimney,with internal fireplaces(2) blocked of, plastered and vented. The drive runs alongside so access is fine.I can imagine this will put buyers off when we try to sell it in a few years time, so whilst we’ve tried to be relaxed about them having a happy home it’s time to get the issue resolved safely! Can you help?